Kids can join in the sing-along fun with songs including This is the Day, Amazing Grace, Jesus Loves The Little Children in this new collection. 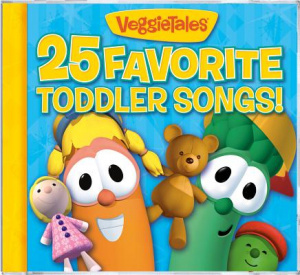 25 Favorite Toddler Songs by Veggie Tales was published by Word Entertainment in April 2010 and is our 3363rd best seller. The ISBN for 25 Favorite Toddler Songs is 0820413115128. Be the first to review 25 Favorite Toddler Songs! Got a question? No problem! Just click here to ask us about 25 Favorite Toddler Songs. Does this include action songs? A:The CD's tracks are: This Is The Day | Pop! Goes The Weasel | Mary Had A Little Lamb | Are You Sleeping | She'll Be Comin' Round The Mountain | Amazing Grace | I've Been Working On The Railroad | Twinkle, Twinkle, Little Star | On Top Of Old Smokey | Standing In The Need Of Prayer | The Wheels On The Bus | Row, Row, Row Your Boat | The Mulberry Bush | How Many Monkeys | Where Is Thumbkin | The Muffin Man | Old Mcdonald Had A Farm | It's Raining It's Pouring | The Marshmallow Song | Don't Ya Know | Here We Go Loopty Loo | Oh Where, Oh Where Has My Little Dog Gone? | The Bear Went Over The Mountain | The Dinner Time Song | Jesus Love The Little Children A lot of classic songs for toddlers here. Plenty of which has actions to teach and do. Thank you for using the Q&A Forum. 22. Oh Where, Oh Where Has My Little Dog Gone?